A New Member in the Family!!!!!! March also brings spring with it (finally!) which means BABY SEASON is upon us. Not just for animals, but also for us humans! 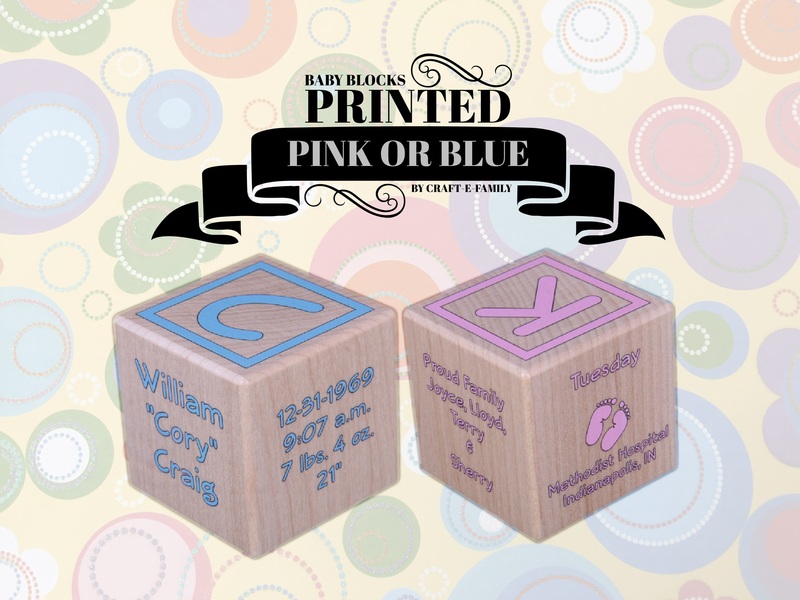 Although, with cute babies coming there is also the pressure of gifts, but thankfully our number one best seller is the Personalized Baby Block. At the shop, we often hear about heated debates on who in a friend group gets the first shot at sending a block. But this year, you can be the first to give a color block with our new upgraded baby block! This project has been in the works for about a year, and we’re now able to show it to you. The blocks are the same as our standard ones, only they now come in color. A poly-whey finish is used instead of beeswax, and rather than being engraved, they are printed – which means it’s all still kid safe! So when those babies start toddling around, they won’t be in harm’s way if they get a hold of their colorful block. Until next time, Keep It Craft E! It seems like just yesterday we were celebrating New Years, and now today it’s March! This means our favorite Irish holiday is coming up quickly this year, and we cannot wait for the food. 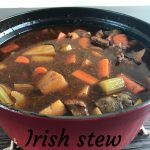 Since Saint Patrick’s Day can sometimes be an underappreciated holiday, we feel the need to make up for this by cooking our favorite dishes. 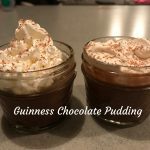 Irish Stew made with Guinness, Guinness Chocolate Pudding, and Guinness Chocolate Cupcakes are recipes that definitely top our Irish list. We also cannot resist adding an Asian twist to corned beef and cabbage with cabbage rolls! We love our food around here, especially Guinness (of course the beer is Irish!) and Asian foods, and we can never celebrate a holiday without special food! If any one of these dishes interests you, I’ve added a link for recipes below. We’re also open to any suggestions! We love to spread ideas for celebrating. 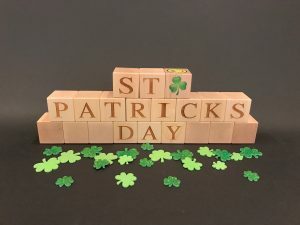 To celebrate with us even more, our Holiday Blocks spelling out St. Patrick’s Day are great for decoration! 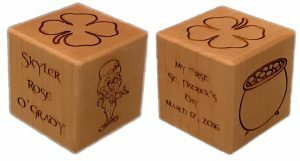 You could create a beautiful dinner table with our Irish recipes (or your own) with these blocks as center pieces, or you could even just set them up in a room to add a little festivity. Just make sure you remember to wear green! Heat the olive oil in large skillet, medium-high heat. Salt and pepper beef, dust with flour and sauté until brown on all sides, about 5 to 7 minutes. Transfer to dutch oven or heated crockpot. May have to do in several batches (don’t crowd pan when browning). Add garlic and sauté another minute, until fragrant. Deglaze pan with red wine, add Guinness, beef stock, tomato paste, sugar, worcestershire sauce, thyme and bay leaves. Stir to combine and bring the mixture to a simmer, then transfer to beef. In skillet, melt the butter over medium heat. Add the potatoes, celery, onion and carrots, sautéing until golden, about 10 minutes. Add vegetables to beef mixture. Bake in oven 350 degrees for about 1 hour until vegetables and beef are tender. If juices need to be thickened add (mix 1 tablespoon cornstarch with 1 tablespoon cold water until combined). Slowly stir into the stew. In large mixing bowl whisk together the egg yokes and sugar. Open a can of chilled Guinness from the refrigerator and slowly pour into 4-cup measuring cup, pouring down side of cup to reduce foaming. Pour half of Guinness (about 7/8 cup) into heavy-bottomed 3-quart saucepan. Add 2 1/4 cups cream and whisk to combine. Set over medium heat and heat, whisking occasionally, until bubbles just begin to form at edges. Remove from heat, add the chocolate, and whisk until smooth. Slowly pour hot chocolate mixture into eggs, whisking constantly to prevent curdling. Return mixture to saucepan and set over moderately low heat. Cook, whisking constantly, until mixture thickens and coats back of spoon, about 15 minutes. (The pudding will look separated.) Pour into blender and blend on high for 1 minute. Divide the pudding among the six old fashioned glasses, leaving at least 1 inch of space at the top of each. Cover with a plastic wrap and refrigerate until chilled and set. Meanwhile, pour the remaining Guinness into small saucepan and bring to boil over medium heat. Reduce heat to moderately low and simmer, uncovered, until reduced to 1 tablespoon, about 20 minutes. Pour syrup into small bowl and let cool. Beat remaining cream until soft peaks form. Add Guinness syrup and beat until combined. Divide cream among 6 glasses of pudding. As we turn our calendars away from January and on to February, Valentine’s Day is almost always on our minds. Even though it is a Hallmark Holiday, it is an important holiday to remind you of the people in your life who you love and who love you back. It’s also a great excuse for showing someone how much they mean to you! A few years back, we came up with this cute little personalized block for a customer and it was too adorable not to share. Not only does it last longer than a box of chocolates (what, no one else eats them in five minutes like I do? ), but it will be there for years to come as a constant reminder for you or your loved one. If Valentine’s Day isn’t for you, or if you’re simply an appreciator of cheerful holidays, then you should check out our Facebook page. I have been having a lot of fun playing with our blocks for adults (a.k.a. Holiday Blocks) and this month I had two options. 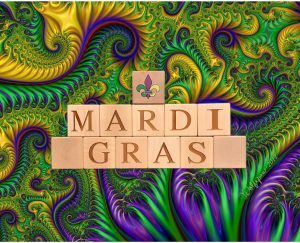 While Valentine’s Day seemed fitting with the personalized blocks, Mardi Gras is only two weeks later. It is a time for celebration and, if you participate in Lent, binge eating any food you might be planning to give up for the month and a half! The Holiday Blocks are great for any holiday or occasion. Every year, I find something new I can spell with them, as I am sure you do if you own a set. Currently, we are at over 100 sayings with the 17 blocks (yes, there is a cheat sheet for those of us who are too lazy to figure it out on our own). If you’ve displayed any cute saying at your house, snap a picture to send to us! We’d love to hear from you. February also officially marks the start of yearning for warmer weather, or at least for my family it does. When we finally reach this month, we’re tired of the freezing weather and we’re excited for the lively and colorful spring days ahead. I love going out every year to snap a picture of the first crocus flower that pops up in my yard. I know they can come up when there is snow on the ground; I’ve got a few of those pictures and they tell me spring is on its way! So perhaps it’s a good thing February is such a short month – it means fewer days till spring, and, if you’re an animal lover like me, baby animals! LeeLoo thinks I’m crazy because every time we drive by the farms on the way to and from school I get excited looking at the baby cows (yes, I say moo to them, and yes, if I could I would take them all home with me). LeeLoo’s favorite thing is going to the local farm animal feed store and holding all the baby ducks. We’ve had some as pets before, but due to bad luck (and coyotes) we just hold them and dream. 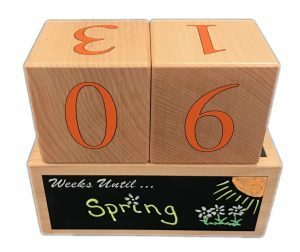 We are really excited to be thinking about spring, and that is why now is a great time to order our countdown blocks. You guys will be able to count down till spring with us, and, when spring finally arrives, erase the chalkboard and set it for summer! It’s official. Our Christmas shopping has begun. Chances are yours has as well – at least your online gift buying. It seems this time of year gets earlier year-by-year. Much of that probably has to do with the fact that few of us budget for the holiday season, so we buy over the span of 3 months… instead of the 2 weeks prior to Christmas. All of that said, we wanted to reach out to you with gift buying tips for some of our smallest customers – babies and toddlers. They’re rolling over, crawling, walking, and they’re in to EVERYTHING. We know. We’ve been there. What many people don’t know is that many infant and toddler behaviors are imperative to teach gross and fine motor skills. We’ve done plenty of research on block play and the importance it plays in early development of our children. It can help with everything from shape identification to team building (for those larger block projects). According to Hands On As We Grow, block play can also significantly help with fine motor skills. Be sure to check out their website for fun activities including blocks. One of the benefits of our blocks beyond the benefits previously mentioned is that they can be used as learning tools. 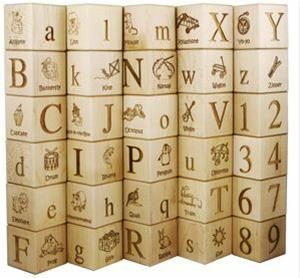 Our ABC Block set hosts letters, numbers and illustrated words. You can imagine that these can come in handy all the way through primary grades. 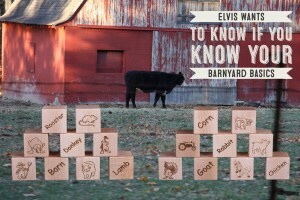 Likewise, our Barnyard Blocks are perfect for the little one learning animal names and sounds. 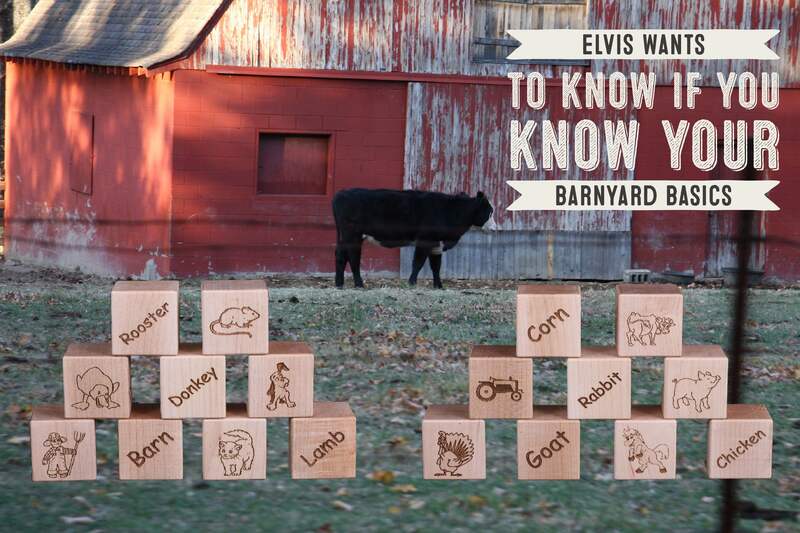 Our Barnyard Blocks even take it a step further and spell out the animal names. Nothing like raising an early reader/speller! 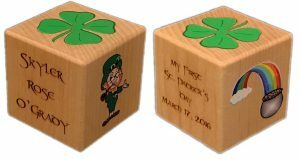 Remember that our block sets and baby blocks are made from all natural products. The edges of the corners have been rounded off so no sharp edges. All block sets are finished with beeswax instead of stain or clear coat. We all know where new toys go for the little ones – right in the mouth. Might as well give them something that isn’t laden with chemicals, right? 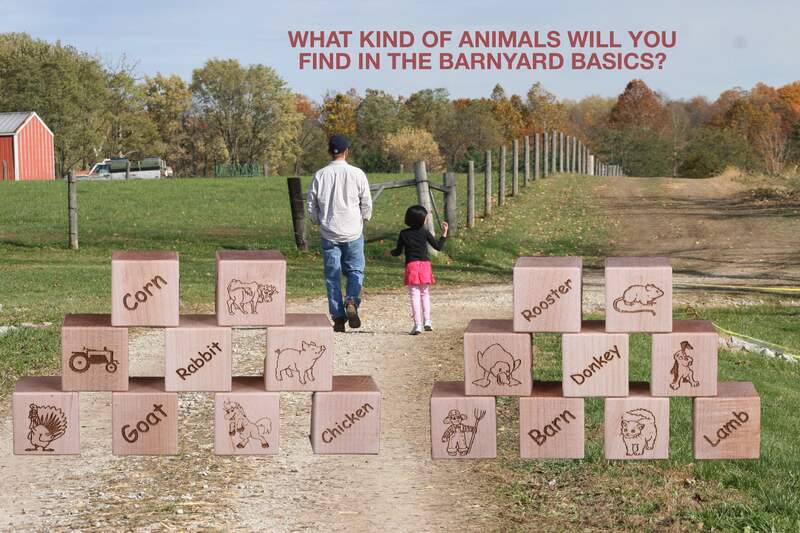 Our Barnyard Blocks come 9 to the set and our ABC Block Set comes with 30 total blocks. We know buying for small children can be tough, but these blocks will provide them with hours of enjoyment – and learning! 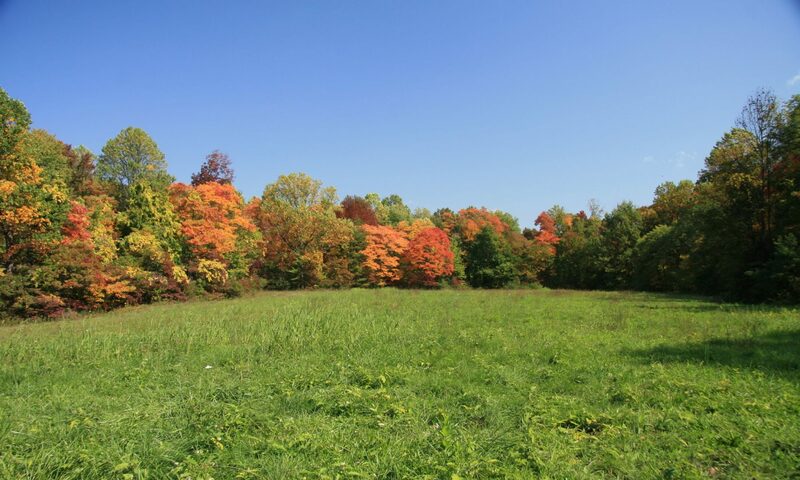 Fall is here, there’s no hiding it at this point. Temperatures have just a little bit of a bite to them. The morning routines involve decision making between long sleeves or sweaters. The changes in the leaves are subtle this early on in the month of October, but they’re there nonetheless. As business owners of a specialty store, this time of year is when business starts to really pick up. We still have a little time before the holiday rush hits, so we take advantage of this weather and our time together before business really explodes in the next 2 months. 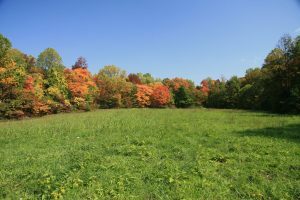 Autumn is a time to be celebrated at CEF. Our family loves walking the property together to photograph the changes taking place in nature. 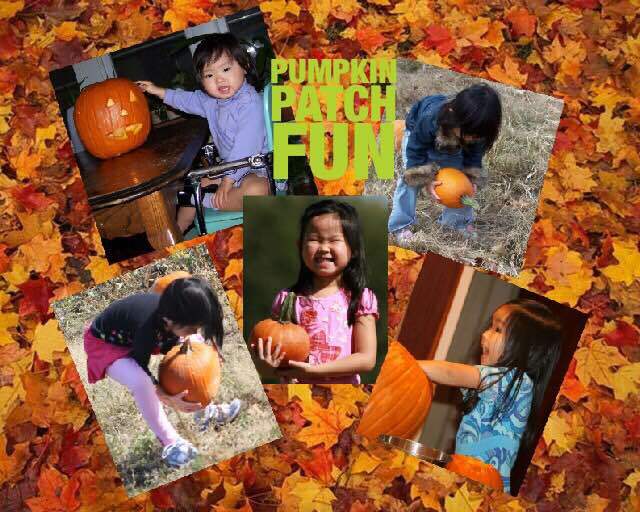 We love looking back on fond memories and we REALLY love the shift to autumn foods. We enjoy making them almost as much as we enjoy eating them. Other than taking walks around our property, we love to take annual trips to Greendell to participate in their hayride, corn maze and of course we pick our own pumpkins. 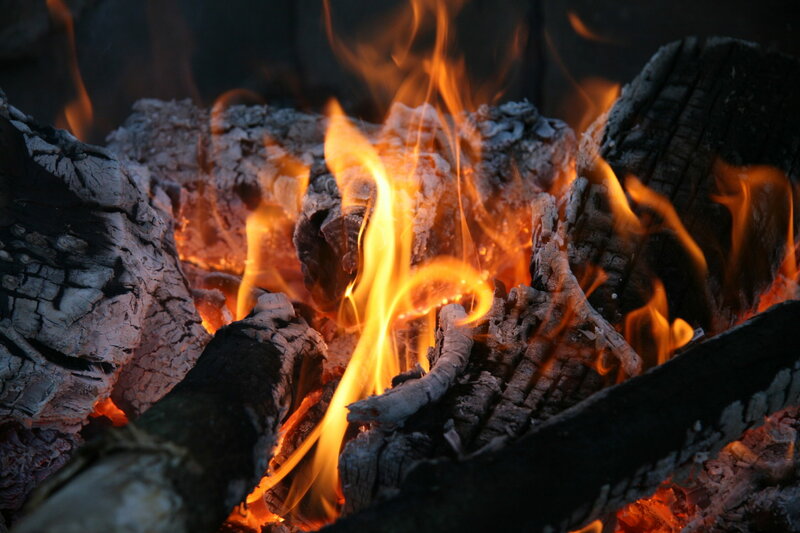 Bonfires help to keep us warm as we soak up the last few weeks of tolerable weather, but they also serve as a way for us to toast up our homemade… yes, homemade (and quite delicious) marshmallows that make a perfect s’more. If you’re not up to making your own mallows, head over to 240 Sweets to buy some of theirs. They’re really good too! Some of the other treats we look forward to this season are homemade chicken pot pies, pot roast, and Williams-Sonoma hot chocolate with homemade whipped cream. Their hot chocolate is now available on their website. We’ve already ordered our years supply! Peppermint bark and salted caramel are family favorites, but LeeLoo’s favorite is salted caramel. 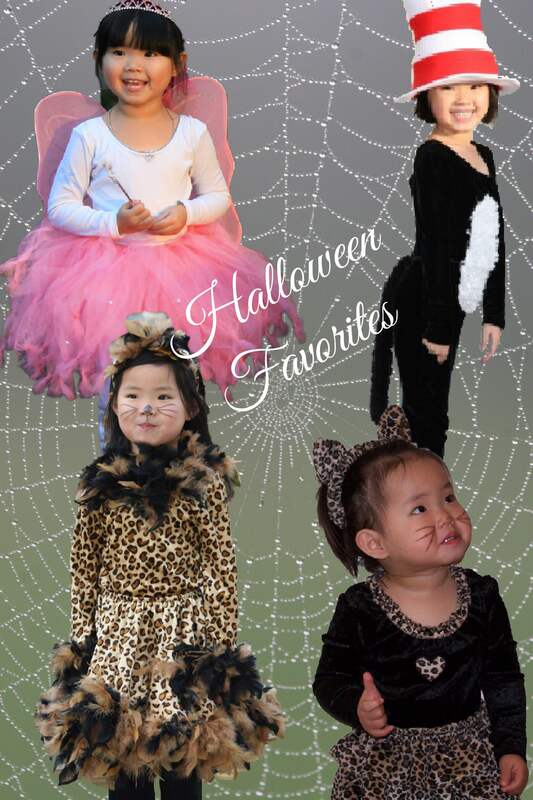 Halloween has been a bit of an evolution in our family. LeeLoo is maturing into a beautiful young lady and as she matures into her teen years – her taste is maturing as well. What used to be a little girl that loved to dress up for Halloween – mostly as a cat – is now a teenager that doesn’t dress up and loves Godiva chocolates. 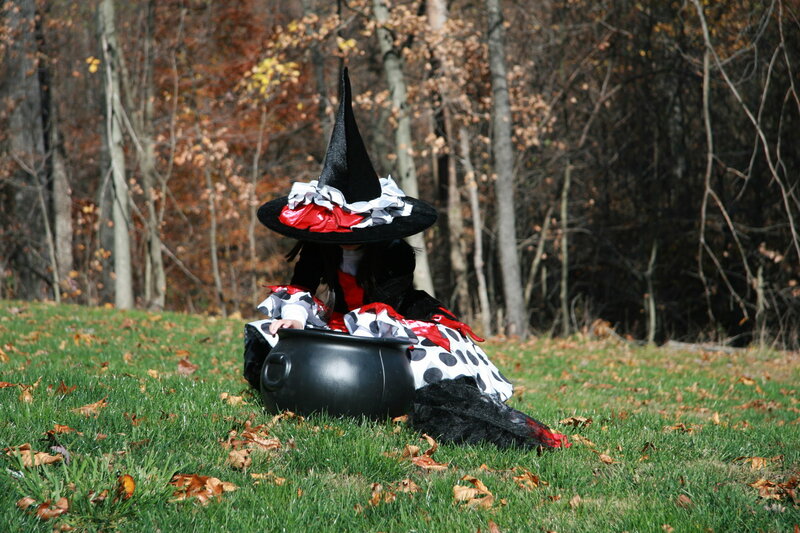 Now we just think back fondly of the times she’d head out to trick-or-treat in our very rural area. She’d receive bags and bags of candy from neighbors since they didn’t get many little ones ringing their doorbell. It’s one of the many joys of country living. 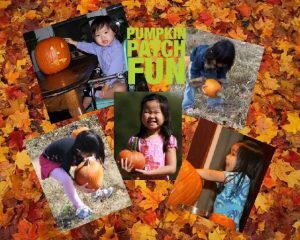 From our family to yours, Happy Autumn! We hope you create some masterpieces when trying these recipes out, but more importantly, we hope you create some memories at the same time. Until next time – Keep It Craft E! Summer Fun & Happy Independence Day!!!!! Wedding & Anniversary Season is Upon US!